Dene Park is a privately owned members club covering a range of sporting and social activities.We have several darts,snooker and pool teams playing every night of the week. 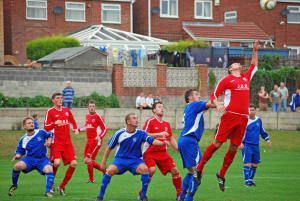 Dene Park is also the home to Hall Road Rangers FC who were promoted to the NCEL Premier League for season 2008-09 they also won the magnificent Wilkinson Sword Trophy!!! in 2007. We now have 10 Junior teams from Under 8s To Under 18s and our Academy for 5 -7 year olds will help us find the footballers for our future teams. Dene Park Social Club is located in East Riding of Yorkshire, England. The address is at Beverley Road, Dunswell, Hull, HU6 0AA. It’s against the club policy to bet on the field, but there are quite enough slots gambling features on the web. Hall Road Rangers were formed in late 1959 by the late Ted Richardson to satisfy a number of football hungry 13 year old schoolboys. The club at this time had no ball, no kit and no ground and had to be content with away friendly games which they duly lost by large scores. The next season saw them wearing the now familiar blue and white hoops and, having rented a new ground on Inglemire Lane, they entered the Hull Boys Sunday Football League. The ground was terrible for holding water and the players had to report two hours before kick off to act as a chain gang to bale the water before any game could take place. The first five league games saw the same pattern of defeats but the patience and coaching was beginning to show itself and they went the rest of the season without defeat, finishing runners-up in the league and winning the Intermediate Challenge Cup. 1962 saw them gain the Sunday Boys League Championship and the Challenge Cup, but this season also saw them expand into the Saturday Boys League in which they lost a play off for the league title with Greatfield. The following year was another great season resulting in a double of doubles: the Sunday League Championship and the cup, the Saturday Boys League Championship and the cup together with the Dr Lilley Cup (ERCFA Youth Cup). 1963 saw further expansion for Rangers with two teams operating in the Sunday Senior League, and two teams on Saturday, one still in the boys league and the other in the East Riding County League. Results for this season were a league championship in the Sunday League and the Mary Halford Cup, the Boys League Championship in Saturday football and also the distinction of being the only junior side ever to win the County League Senior Cup. 1965 recorded that Rangers won a leaue championship in the Sunday League and, in Saturday football, a County League Championship, the ERCFA Intermediate Cup and the County League Junior Cup. Lear somethin more about our stadium and community. 1966 was a lean year for Rangers due to a long list of bad injuries and they only managed runners up in the Sunday League Championship. Then followed a big step into Saturday football to the Yorkshire League and the winning of the league championship in 1973 and 1980, and when the Yorkshire League changed to the Northern Counties East League there followed another Championship year in 1991.In 2008 the the first team achieved promotion to the NCEL Premier Division after finishing 2nd in the NCEL First Division. Throughout their history the club have always been interested in providing facilities for local footballers and have keenly followed each individual players progress in the football world. THe club has also an anti-gambling policy when it comes to the matches but you can check out some recommended online bingo sites here. Changes on and off the field of late should carry the work Ted started nearly 50 years ago as the club continues to expand and grow its junior and adult sections.